What Are the Treatments for Wicker Furniture? Wicker furniture pieces are beautifully handcrafted works of art. This type of furniture is made from thin, vine-like pieces of wood such as bamboo, willow, or rattan (natural wicker), or man-made paper fiber vines (paper-fiber wicker). The vines are then woven around a wooden frame and shaped into furniture for in-home and covered-patio use. As with any furniture, over time the finish on your wicker furniture will begin to wear and needs to be treated to keep it from becoming damaged. If there is mold on the furniture, use a solution of 2 parts bleach to 1 part water before you wash the furniture. You can use a scrub brush, or even an old tooth brush to help scrub off the mold. A tooth brush will get into hard-to-reach areas. Then use a garden hose and detergent to clean natural wicker; use a damp rag with detergent for for paper-fiber wicker. You run the risk of your paper fiber wicker falling apart if you soak it. 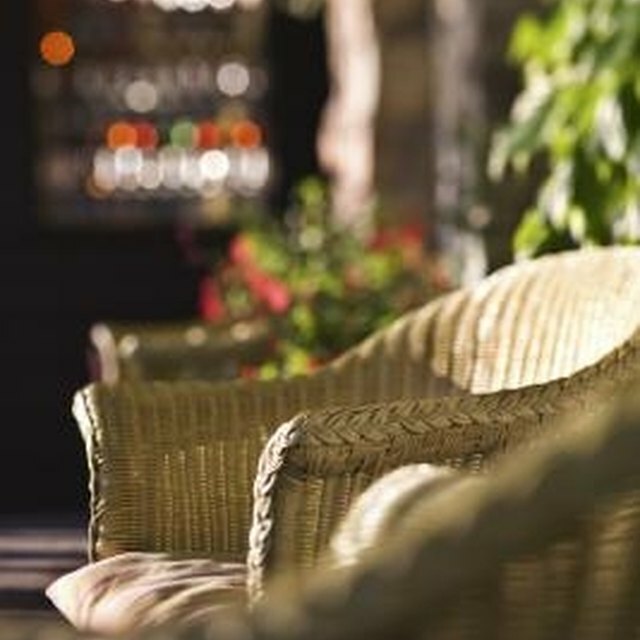 You can use a scrub brush on both types of wicker furniture to help remove dirt and grime. Before applying a stain and clear coat, condition your natural wicker furniture using linseed oil (boiled) and turpentine. (Omit this step if your furniture is made of paper fiber. Linseed oil soaks into the wicker and can cause the paper fiber to become weak) Mix together 2 parts turpentine to 1 part linseed oil, then brush the mixture onto the furniture. Allow to dry for at least 5 days before applying an oil-based stain. Oil-based stains must dry for at least 8 hours before applying the clear coat. When the stain is dry, brush on a coat of clear varnish to protect your furniture, and allow it to dry for another 8 hours. Natural wicker and paper fiber can both be painted. Use an oil base primer that is rated for all surfaces; this will allow you to use a latex or water base paint for your cover coat. Latex paints will not stick to stain or surfaces that have been previously painted with oil base paints. You can use a brush, or for a more uniform and faster method, an airless sprayer, to apply your cover coat. Allow your cover coat to dry for a minimum of 4 hours before applying a second cover coat.